Basically, if you threw out the limitations of the original TR-8, put it in a more attractive case, and expanded the sound and performance powers of the box, of course you’d make us happy. 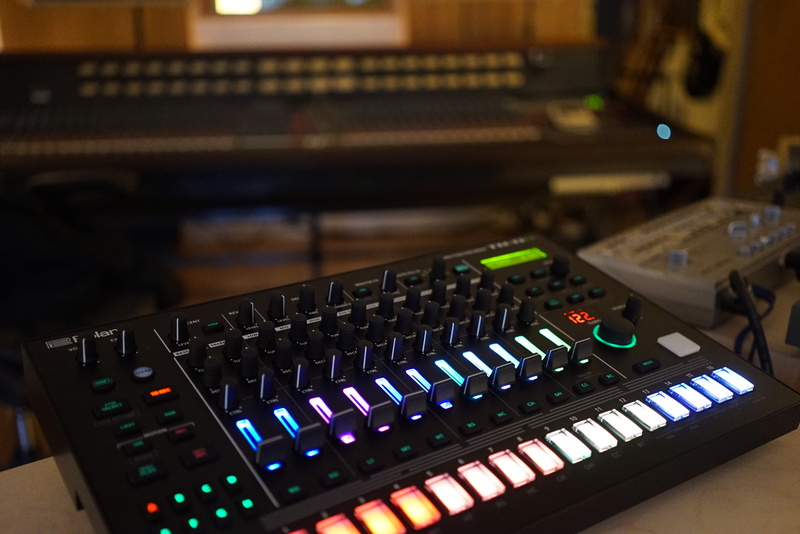 So the TR-8S loads your own samples, atop a wider, updated range of built-in models of classic Roland gear and preloaded sonds. It’s more playable and immediate, thanks to expanded controls and functions. It has effects sends for each part, plus a bunch of new effects to choose from. It lets you record automation, so you can make the sound shift along with your drum patterns. It integrates more easily with other gear, thanks to separate audio outs, and with your computer, thanks to a multichannel USB connection that also lets you use the onboard effects. 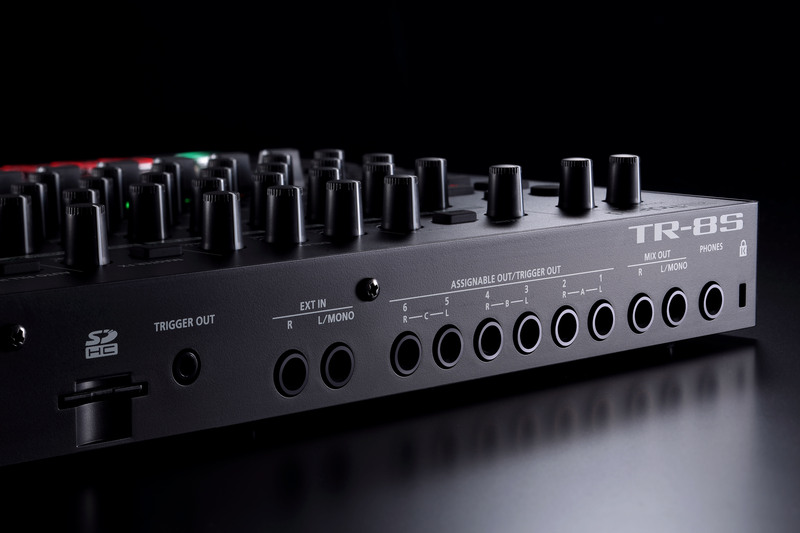 To put it even more simply: the TR-8S makes more sounds, and it’s more fun to play. Oh yeah, and it looks pretty instead of fugly. It’s still not a sampler – you only get sample playback. And it’s not a new drum synth – while it models the original Roland machines, there are only emulations of old circuitry, not any new models. But instead of just feeling like an 808/909 rehash, the new TR-8S really feels like a new hub for sequencing and drum parts, one that is equally at home with gear or a computer. Price – US$699 (EUR699 with VAT), available this month. Note that clock input is available only via MIDI and USB, but then you still have up to six outputs that can be reconfigured as triggers plus the trigger out so with that (and a MIDI adapter) you’ve got loads of options. After some time with the machine, there’s a whole lot of different dimensions here that add up to a box you really want to use live. Let’s not forget the reasons the TR-8 became a hit, shortcomings or no. It pretty well nailed widely-used 808 and 909 sounds and behaviors. But that alone wouldn’t be enough – to become a live gigging favorite, the TR-8 had to also add hands-on controls. And that seems to be why so many people adopted it. The faders alone make it instantly more appealing than a whole host of competing drum machines. It means you can actually play the thing, as if it’s an instrument. So any number of fancy, expensive drum machines are useless as live instruments if you’re navigating those features by diving through menus rather than playing them. The problem with the original was, the box wasn’t much more than a nice interface to those sound models. Even adding 727 sounds was a paid add-on. And the available effects were limited. Plus there was the weird “scatter” function, which scrambled patterns rhythmic variations and effects in a way that seemed to cater to EDM fans, but afforded very little control. And let’s not get started on the toy-like green case and blinding lights. The “S” revision does more than just address some shortcomings. It manages to present a much more capable device, all round. More sounds. 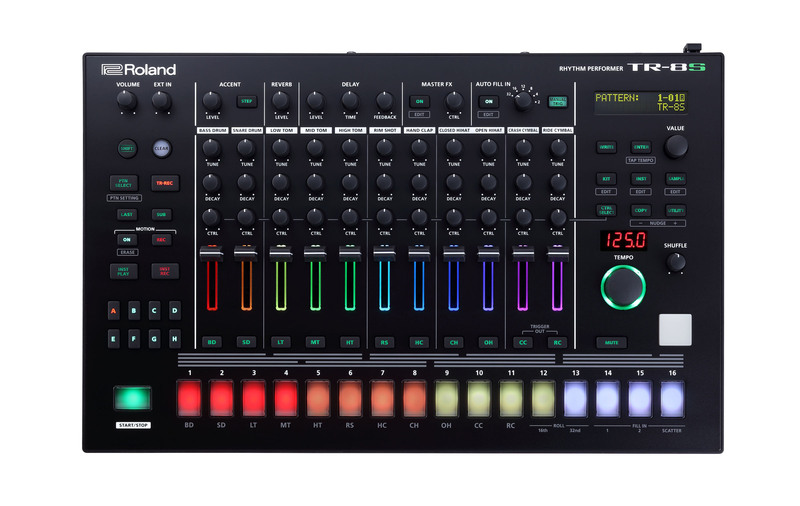 The TR-8S has a host of sounds included right out of the box: 808, 606, 909, 707, and (Latin!) 727. (Let’s assume they’re saving the Roland CR-78 for a small Boutique Series remake?) 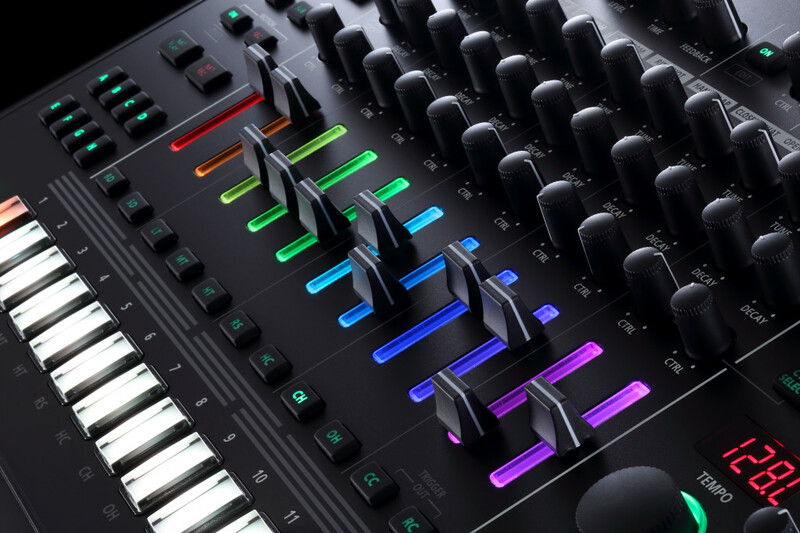 Roland also says these now incorporate new modeling tech running on a new processor, though I haven’t yet been able to evaluate how that compares to their other recent gear. Note again that this means they’ve modeled the analog circuitry of their original analog drum machines, not simply included samples of the sounds those make. That’s the Analog Circuit Behavior (ACB) technology they like to tout. The unique ploy here is being able to mix up that engine with other sample-based sounds, including your own. Sample loading. That “S” in the name is obviously for sample playback. There are a bunch of new built-in samples, plus an SD card slot round the back of the unit. Load your own samples there, and adjust basic parameters (speed, start point, direction). You can’t load big one-shots, so this is about custom kits, not playing stems or backing tracks. There’s no live sampling capability, either. But you do get to build kits up from your own sounds or mix and match with the TR’s circuit models. In addition to step-programming accent, you can also use a single, velocity-sensitive pad for adding more levels of velocity live. This isn’t an MPC by any means, but it fits the workflow of the Roland, while allowing more nuanced performances. You can add flam, too, via the step sequencer. And all of this is just as easy as toggling steps normally is – so complex rhythms become easily accessible. This unassuming green pad lets you add velocity and not just push-button steps and accents. The other reason all of this matters: think of the TR-8S as a powerful rhythm programmer. Because it has trigger outs, you can use this power with synths and other drum machines, not just the internal TR sound engine. More patterns and automatic chaining mean the TR-8S lets you make more complicated rhythms – but while retaining the simplicity of the original. The same is true of adding subdivisions to a rhythm. Tap “sub” and you can add more complex rhythms on an individual step. For automating variations, you can now use sophisticated fill controls. Powerful effects. The first TR-8 had some basic effects, but the TR-8S has effects that work both on individual parts and on the master, with more complete control over each. There are independent stereo reverb and delay sends for each instrument. You simply dial in the effect you want, and then it’s always there for use from the CTRL knob on each part. 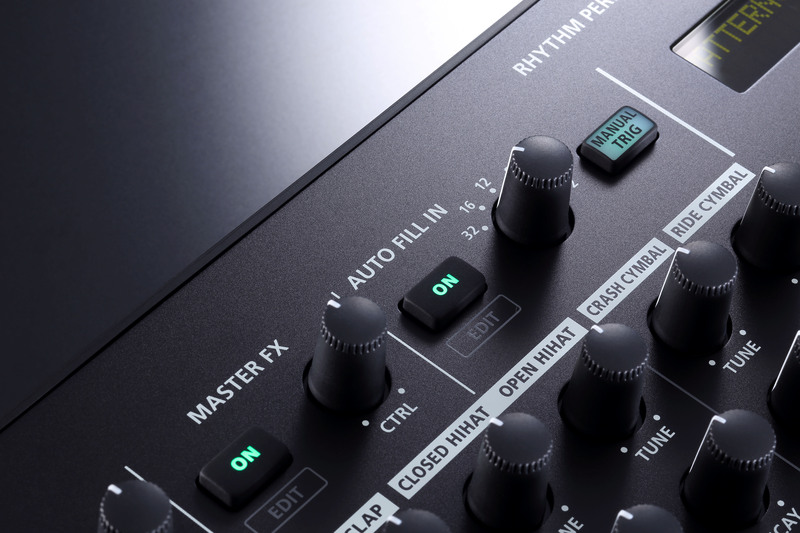 Above those signature faders, a new third “control” knob is assignable and lets you tweak parameters and effects sends for each part. Everything is tweakable. Each sound gets its own tune and decay parameter, plus an assignable controller (the additional knob) which you can use to gain access to more parameters or to the effects sends. This means you can take those TR sounds and warp them, or work with your own samples in new ways. And those three knobs let you shape sounds as you play. You can also record motion automation and add it to patterns. That was definitely an oversight on the original TR-8, but now that it’s here, it pairs nicely with the new rhythmic features and assignable controllers. Multichannel connections with gear and computers. Separate outputs – at last! Loads of I/O – input plus separate outputs/triggers. Connect to a computer, and all of this is also an audio/MIDI interface. Flexible lighting. It’s not just the green trim that’s gone. The LEDs now seem designed for users and not just to look flashy in music retailers. So in addition to dimming the lights, you can set color and glow options to keep track of what you’re using. The important thing to me about the TR-8S isn’t really its power on paper, but the fact that you get all of this as something you can play and improvise with. There’s some light menu navigation required to get things working the way you want – deciding what the CTRL knob for each part does, adjusting a particular parameter, selecting your kit. But then once that’s done, everything is accessible without menus or complexity of any kind, in a spacious, obvious control layout. That frees you up to focus on rhythm and sound, directly through physical interaction – not through a bunch of programming and editing. We actually had two TR-8S units on hand, so … we used both of them. What I learned here was: this is a heck of a lot of pure, unadulterated fun. And it’s fun that’s uniquely easy to share with others, because the front panel is roomy and easy to understand. I’ve also uploaded audio – not so much to try to document the sound of the box, so much as the expanded range of rhythms and sounds that come from its new functionality, and how freeing that might be in a real-world live improv. Roland’s own moniker for the first TR-8 was “rhythm performer.” What’s cool about the TR-8S is that it actually delivers on that idea. It was easy to see the first round of AIRA as just an inexpensive reboot of stuff from the past. But I think it’d be unfair to characterize the TR-8S that way. It now presents a really complete sequencing workflow, and a set of use cases for outboard gear (both analog and digital), and for combination with a computer. Do you still need to be an 808/909/vintage Roland fan to apply? Yeah, probably. But that no longer has to be the end of the story. 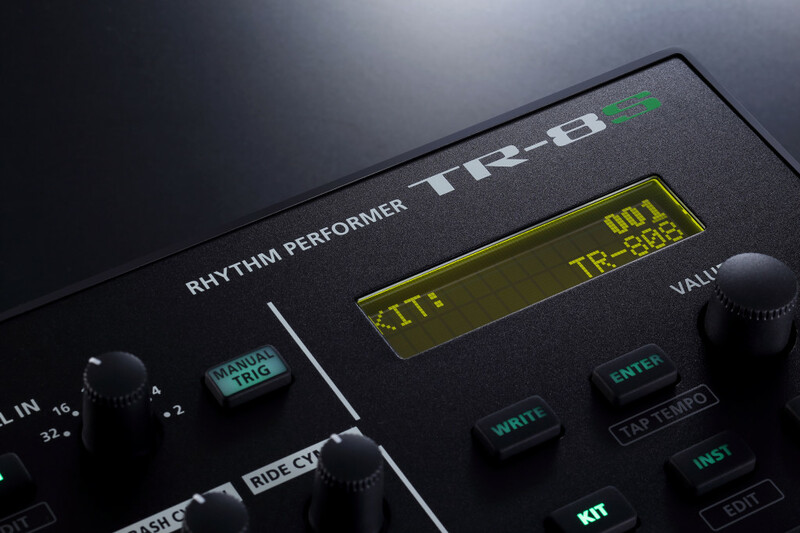 What already promises to set the TR-8S apart is, it has an unparalleled amount of sequencing power right on the front power, coupled with those sounds. Consider the main competitors in this price bracket. MFB’s boxes are cool, but they’re mainly about sound. Elektron’s Digitakt is cute and compact and powerful, but that power isn’t nearly as accessible under your fingertips – and it lacks separate outs for instruments and triggers. Arturia’s DrumBrute has full analog synthesis for each part coupled with dedicated controls specific to them, and 12 separate outputs. 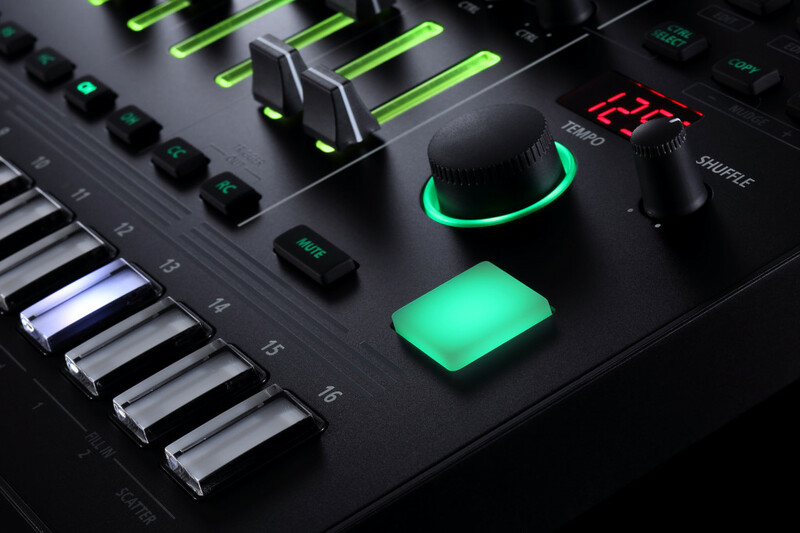 It’s arguably more focused as an instrument, to be sure – but it’s more limited in sound (synth only, no samples) and sequencing (roll your finger along a touch strip for live rolls, but none of the sub-step and more powerful variation and fill features of the TR-8S). Novation’s Circuit earns extra points for doing melodic sequencing of its samples – but then again, it’d make a nice complement to this for a pretty cheap rig. Here’s the funny thing: each of these boxes becomes a nice pairing with the TR-8S. The first AIRA was middle-of-the-road thanks to a friendly interface and known sounds. But this one does that and then also can literally sit at the center of the other gear you might like to use. It removes the kind of limitations that might make you make boring sounds or boring music, but keeps the simplicity so that people can feel free to jam. Really, if there’s anything bad to say about the TR-8S, it’s that Roland aren’t using their circuit modeling techniques to open up this box to new sounds. We have software with great drum synths (including recent releases of Ableton Live and Maschine), and new hardware with new synthesized drum (Moog DFAM, Arturia DrumBrute), and modular, and so on. And we have a ton of music that already uses those sounds. The absence of solo and undo – plus MIDI transmit options – cry out for a firmware update already, too. Correction: Seems solo is there! I think this may have shipped in a firmware update while we were testing, but yes, as I’d want, MUTE, then SHIFT + part now solos! 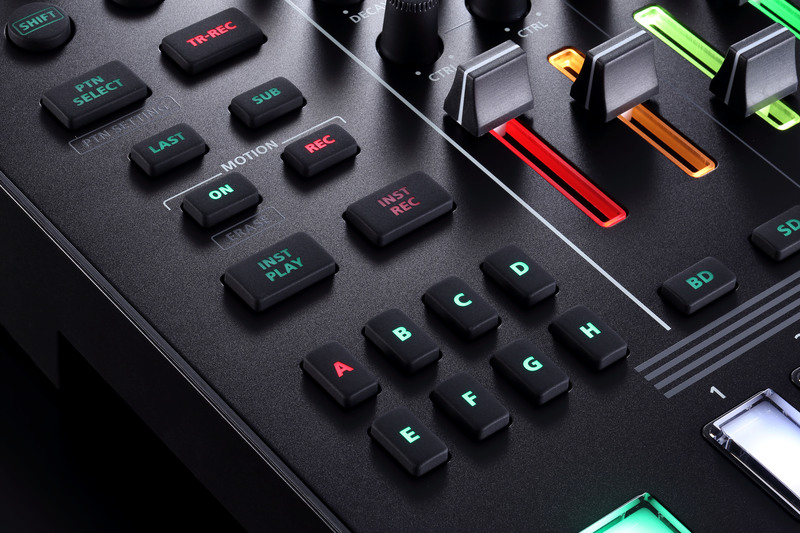 But apart from those criticisms, everything about this box – the balance of the design, its capabilities – represents the best of what we’d hope for from Roland. And I think the combined utility of this box will make it wildly popular onstage. Expect this to be one of the devices that helps lead the charge toward spreading more live sets. There’s more to say about the specifics of how MIDI and performance options work (and some room for improvement in some of these details for future firmware updates). So expect more on this topic soon, plus some videos Roland is producing on how the gear is used.